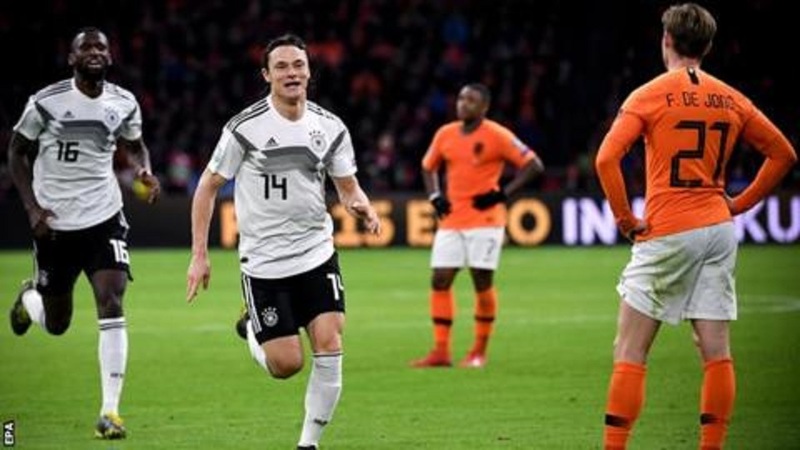 A 90th-minute goal from Germany’s Nico Schulz has sealed a thrilling 3-2 victory over the Netherlands in the Euro 2020 qualifiers this morning. Fox sports reports, it was a game of two halves that saw the Germans leap out to a big lead before being reeled in. Serious quality was on display as the next generation talents of both traditional football powerhouses showed their wares. The first time they’ve won on Dutch soil since 1996. Elsewhere, World Cup finalists Croatia were stunned 1-2 by World number 52 Hungary in a massive boil over. Belgium cruised past Cyprus 2-0 as Eden Hazard scored on his 100th cap. Meanwhile, a double from Marko Arnautovic was not enough as Austria went down 4-2 to Israel. In other matches, Scotland got their first win of the campaign by beating minnows San Marino 2-0, and Russia destroyed Belarus 4-0.